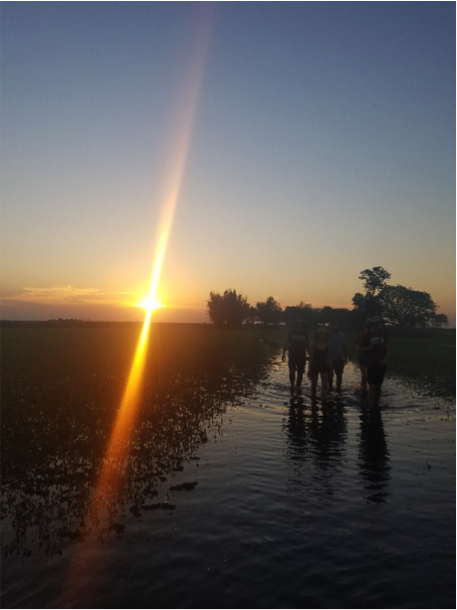 Sunset while walking through wetlands to campsite. A weekend escape from the city is the best medicine. 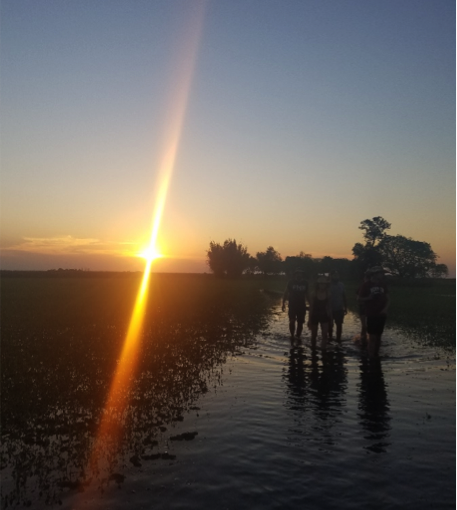 One of the most amazing experiences so far during my study abroad was going camping in Los Esteros de Iberá, otherwise known as the wetlands. Kayaking, tenting, bonfires, an off chance of getting attacked by a snake and sleeping (or not) through the worst thunderstorm of your life with the possibility of everything in your tent becoming soaking wet, what can be better than that? Having the right companions with you makes the experience even better. You realize you endured some not so fun events together and can laugh about it all later. Keeping a positive attitude is what makes the adventure one of the best memories of your travels, plus you have a story to tell when you get home to your friends and family. Los Esteros are not a heavily populated area. They are located in the province of Corrientes in the north of Argentina, expanding throughout 30 percent of the province. It is not a very touristic part of the country, either, creating a better chance of encountering the culture of this area in Argentina. The indigenous Guaraní people inhabited Corrientes before the colonization of the Spaniards, and the Guaraní language is still spoken by 60 percent of the population. To get from village to village, canoes and other rowboats are towed by horses that wade through the water. While on the voyage, don’t forget to take pictures of the alligators and capybaras. There may be even more exotic wildlife as well, so keep your eyes open. Winters are cold without snow, and summers are dying hot. Just being there at the very beginning of their spring, it reached 110 degrees Fahrenheit. Sunscreen and bug spray are very important to carry. You’ll start scratching at your legs and ankles a day later not even knowing the mosquitos had been biting you. And if the locals tell you to buy shoes, las alpagatas, that are a size smaller than your normal shoe size because they will expand in the water and mud, that’s a lie because they shrink instead. The stars are clearly visible and the Southern Cross constellation (equivalent to the North Star) shines bright through the night. The star, Lucero, is the first to appear at dusk and last to disappear at dawn. If it fills with water, the light will dim until it is completely gone. It is truly a phenomenon to watch. Telling scary ghost stories and legends of the Guaraní tribe around the campfire at that time while watching the storm roll in from far away, the moment was peaceful and perfect.